Why a login to multiple computers at once? Traders or operation centers working with multiple screens or with a video wall require a single login to multiple computers at once. Evidian proposes a unique feature on the market with a single authentication to lock / unlock all sessions on a cluster of computers. The solution is compatible with all available user access authentication methods: password, smart card, RFID, biometrics. The Evidian cluster mode is intended to employees who have on their desk several computers and need to use them at the same time. The cluster mode is also useful for a video wall displaying screens of multiple computers that must be open with a single authentication. How a login to multiple computers at once works? A cluster of access points is a set of computers on which the Windows sessions are synchronized by Evidian Authentication Manager. Operations that a user performs on the Windows session (opening, closing, locking, unlocking) of a computer that belongs to the cluster are automatically and simultaneously performed on all the other computers that form the cluster, as illustrated in the following figures. When a user performs an operation (opening, closing, locking, unlocking) on a computer, this computer becomes the master computer and periodically informs the slave computers of the operation performed. This allows the management of slave computer behaviors. The cluster function is compatible with all available user access authentication methods (password, smart card, passive and active RFID, biometrics). 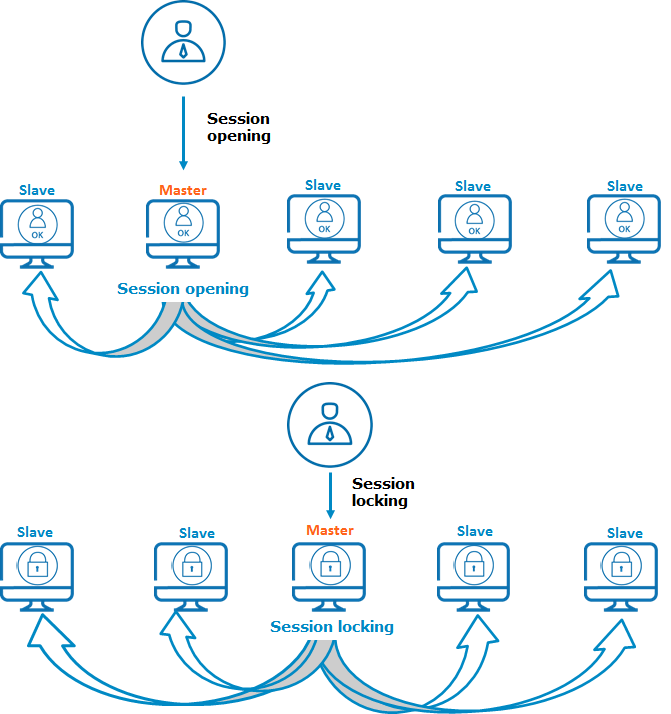 When a user opens a session on a computer of the cluster, all the sessions of other computers of the cluster open with the same user account. If a slave computer is not reachable at session opening on the master computer, the session opening operation on this slave computer will be performed as soon as the network is restored. If a slave computer restarts, and if the last operation performed on the master computer is a session opening, a session will be opened on this slave computer as soon as it is available. When a computer is locked, all the other computers are locked according to their defined lock mode. If a slave computer with an open session does not receive any information from the master for a period of 30 seconds, it is automatically locked according to its defined lock mode. When the user closes a computer, all the other computers of the cluster are closed. The user can decide to reboot one or several workstations of his/her choice or the whole cluster at once. The following video shows delegation of user account in a cluster of computers. To know more about authentication management, we recommend this white paper: "Strong Authentication - Reducing hidden costs".